Now that fans can watch Star Wars: The Force Awakens over and over again on Digital HD, Blu-ray and DVD, fans will surely be examining every frame of this blockbuster, to search for more details and even clues for the upcoming Star Wars: Episode VIII. Entertainment Weekly recently caught up with director J.J. Abrams, who teased that one mysterious prop was actually meant for an earlier scene. The prop in question was a table filled with ashes, which actually illustrates just how nefarious Kylo Ren (Adam Driver) really is. The ash table was featured during a scene on the Starkiller Base where Kylo Ren is interrogating Rey (Daisy Ridley). When Kylo takes off his helmet, he places it on this table, which was actually designed for another Starkiller Base scene. Here's what director J.J. Abrams had to say about where this unique prop was originally supposed to show up. "The backstory is, that that table has the ashes of the enemies he's killed. That moment was actually shot for, and meant to be used in, the scene where he was talking to the Vader mask. He originally had his mask off the first time we shot that scene. Then we reshot it with his mask on, but we had that shot which I loved and thought was so cool of the mask being slammed down into that ash. So that shot was stolen from the scene that we had changed and put into the scene with Rey." 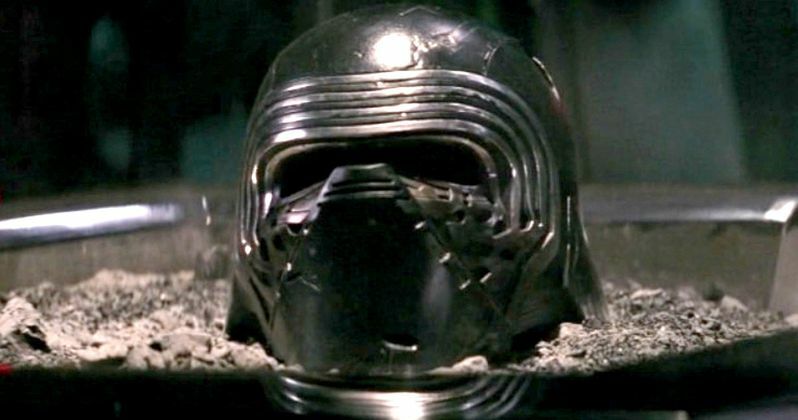 If the Vader mask scene was shot as originally planned, fans would have seen Kylo Ren's face much earlier in the movie, when he delivers that iconic speech about finishing what his grandfather had started. In the interrogation scene, Ren was always supposed to take his mask off to face Rey, but before they moved the ash table over to this shot, earlier takes were quite lackluster. Here's what the director had to say about how Ren removed his mask before the ash table was brought on. "He used to place his mask gingerly onto a piece of the set, which was incredibly unimpressive. So this moment made it a much cooler beat." Naturally, we do not know exactly whose ashes are on that table, or how long he has been collecting them for. But it all seems to be in vein, since they assumably blew up along with the rest of the Starkiller base when it was destroyed by the Resistance. What do you think about these new Kylo Ren details? Do you think Kylo Ren is even creepier now that we know he collects his enemies ashes? Check out this photo of the ash table below, and let us know what you think.